Sayonara for the month of August. It is not that I do not love you, but I follow my own advice—at least some of it some of the time! I write about balance in women’s lives, and I need to keep that in mind for myself. I am putting down my computer for a while and concentrating on other things. Things like family, travel, friends, a few good books and the the weeds that are flourishing in my garden. It has been a good year. Scores of speaking engagements, lots of seminars and conferences to stay current on the issues, a new web site, a blog, a manuscript for an exciting new book and more. The momentum is growing, and I am very excited where the project will take me—-US, really, because you are my focus—one of the things that gets me up each morning because I know that together we can make a difference for women lawyers. I am filling my speaking engagements for the fall, so let your schools and firms know that now is the time to get on the schedule. I also am gearing up for an ABA panel in October, and I hope that I will see many of you there. Lots to look forward to. So, have a wonderful close to the summer, get refreshed, read my book if you haven’t yet, and I will see you in September, as the song lyrics say. Trust is everything in the law profession. Establish your reputation as trustworthy and live up to it. Have the audacity to make a difference every day! Last week was hot on the east coat for a number of reasons. Yes, the mercury was off the charts, but things also were “hot” at the National Association of Women Lawyers (NAWL) conference at the Waldorf Astoria Hotel in NYC. There were hot topics from some leading authorities on issues affecting women in the law. 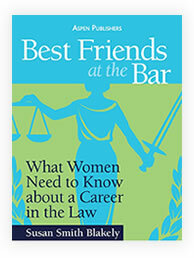 You can imagine my excitement to discover that all of the topics discussed are included in my book, Best Friends at the Bar: What Women Need to Know about a Career in the Law, and are expanded on in my new book, which will be released in 2012. However, my books have twists that go beyond just reframing the issues. I actually propose some solutions! Novel, indeed! Stay tuned for more on the second book. 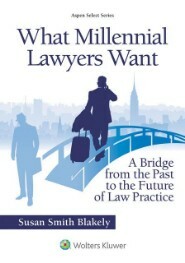 It addresses the New Woman Lawyer—Gen Y. They are not their mothers’ lawyers! Not by a long shot, and we should be happy about that. What is that definition of insanity: Doing the same thing over and over and expecting a different result? We need a different approach and a different result. The conference focused on implicit bias and had some interesting perspective from Jerry Kang, Professor of Law and Asian American Studies, UCLA Law. I was particularly interested in his comments, and those of fellow panelists, about the implicit bias that some senior woman lawyers have against some younger women lawyers. This can be based on appearance, dress, demeanor or just because the young women have a different approach to practicing law and living their lives at the same time. These biases exist even when the young woman lawyer is doing an excellent job and meeting all of the deadlines. This is not exactly Women Helping Women, a theme I stress in both my book and the new manuscript. I really hope that one day soon we will become enlightened and able to stop talking about this over and over. 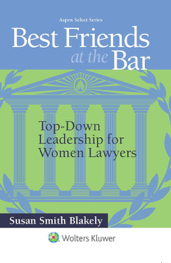 Too often the senior women lawyers show bias toward their young, dynamic women colleagues with attitudes that are shocking. The senior women seem to be saying, “We worked for you to have these opportunities, but we do not want you to take advantage of it.” One of the panelists pointed out the irony that the Baby Boomer women lawyers have raised their daughters to be powerful and independent women, and many of their daughters now are lawyers. However, no matter how much those senior women support their own daughters, they cannot tolerate other similar young women in the workplace. It reminds me of what I tell young women about having children. Yes, you may not think that you like little kids–in fact they may annoy the heck out of you– but that does not mean that you should not have some of your own. It is ALL different when they’re yours. You cannot get enough of them! You will be happy to know that I spoke up for you. I suggested to the group that young women lawyers are deaf to our haughty conversations about how it was “in the day” and are offended by the wagging of fingers while hearing that we can tell them “a thing or two.” Yes, we have a lot to share that will help you, but we need to find voices that will appeal to you and that you will listen to. Those voices cannot be judgmental. Those voice scannot be condescending, and those voices cannot be preachy. Those voices must be authentic. Those voices must be sincerely caring, and those voices must be helpful. You young women know the difference, and you have a right to more. Young women lawyers today are expanding the model and redefining who they are. They are NOT willing to hinge their success on being “men in skirts”. Rather, they believe that there is a wider range of behavior attributes that can be defined as professional. They are young women modeling success while pushing the limits to fit their own generation and lifestyle. However, they too often are met with resistance from the very women who should be cheering them on. You know that I am your biggest cheerleader, as long as you use your femininity appropriately, always act professionally, and be the best lawyers you can be. 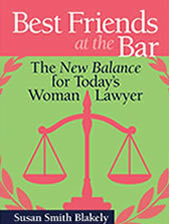 I think that there are actually many more senior women lawyers just like me. They just need to take the time to think it through! There is a lot in that one quote. She is talking about your demeanor, how you dress and how you balance personal and professional responsibilities. I agree with her on most of it, but I am much less likely to tell you to be perfect. In fact, I think that is too high a standard for most of us. Give your career a chance. You cannot get further down the road unless you are on the road! Be nice to everyone you meet in the courthouse. One of them may turn out to be a juror in your case! This seems particularly apropos with all of the citizen attention on juries in the aftermath of the Casey Anthony trial. But, I also have some personal experience with this. When I was a young lawyer, I had my first jury trial in a courthouse where I was quite familiar. As I entered the courthouse on the morning of the first day of trial, I noticed a man who seemed uncertain about where he was going. I approached him and asked if I could help. He told me the room number that he was looking for, and I said I was going that way and suggested that he follow me. Together we found the room, and I immediately recognized it as the place where potential jurors report. Many jury trials took place in that courthouse every day and still do, but I knew right then and there that I had done the right thing in taking time for that gentleman. I knew it was a long shot, but there was a possibility that he could end up on the jury in my case. I gave it a moment’s thought and then forgot about it and got on with last minute trial preparations. It was a long morning of pre-trial motions before the judge began the jury voir dire and impaneling process. It was a simple case, and the process moved quickly. Soon the jury was impaneled, and there in the second row of the jury box was the man who I had helped. We did not know each other, and we had no past business dealings. I didn’t even know his name. His responses had been totally correct to all of the judge’s questions. But, there he was smiling at me, and I smiled back. I asked to approach the bench, and the judge granted my request. I told him about the “encounter” with the juror in the second row, and the judge smiled, too. I was young and inexperienced, and the judge was kind. He knew the encounter did not amount to prejudice, but he did not chastise me for wasting his time. That was all. The juror in the second row stayed in the second row, still smiling. So, you never know when you might be helping a potential juror. However, if it ever happens to you, I hope it turns out differently. As for me, I got a directed verdict against my client at the end of the first day. There just was not much time to get to know the juror in the second row! I have been MIA for the last day or two because I was having so much fun wrestling with my computer! You see, I am in the final stage of completing the manuscript for my next Best Friends at the Bar book, and this is when it really gets hairy. Up until now, my word processor and I have been getting along quite well. We have a mutual understanding. If I keep the pounding and cursing to a minimum, the word processor does most of what I need. I even have explored some of the nuances of this machine, and I can now do some fancy sort of stuff like make colorful boxes of information with subtle shading—stuff that I think should impress my editor. With more than 100 pages of manuscript, there is plenty of opportunity for pretty boxes to keep the reader awake. But today was different. Today was the day that reminded me of this same day three years ago, and it was painful. Here’s why.